It’s 01:41 Day One at the Copenhagen Six Day 2010 and I’ve decided to rattle off a few lines before I succumb to the coma that surely awaits me. It wasn’t vintage racing tonight; there wasn’t much of a crowd, the whole bunch looked like it was pedalling in mud and Franco said he’d never seen Bruno struggle the way he did in the first chase. My feet hurt from all that standing and walking on concrete; and my ears are ringing, courtesy the PA.
…And that was all I could manage before I keeled over. You have to respect the mechanics though, as we stumbled in through the hotel reception, there they were, sitting on the couch, nice looking bottled beers lined up – and those puppies aren’t cheap in this country. Madsen, “Mini Mørkøv” and Smith Larsen prepare. I was up at 06:00 yesterday, to write up the diary. The breakfast rendezvous was at 08:00 – and there was Danny Clark, all time “king of the starts” in the Sixes – 236. I don’t think that will ever be beaten; in Danny’s day a rider could cram in a dozen or more races from October to February – next season, that figure may be down as low as six or seven. Danny looks younger every time I see him, he lives in Italy now; he’s slim and has lost a lot of the lines around his face, don’t ask me how. He’s a derny driver, but might just be tempted to give us a song, his signature number is; “My Way” – that’s for sure! When you’re world champ, you get your own shoes! The first day is always a guddle; guys forget to bring things, we forget to do things, and there are a hundred and one loose ends to tie up. Not least of these being the 12 Saxo Bank logos we had to heat-seal on to Alex and Michael’s jerseys. ‘Three jerseys each, so how come it’s 12?’ I hear you ask. Fact is that the boys have two sets of jerseys – the red and white Danish number 7 ones, plus the rainbow jerseys of world madison champions which they have to wear for the presentation and chases. Danish #7 and Rainbow jerseys for Ed’s boys. The Danish number 7 jersey is a tradition in the Sixes, worn by the country’s great Six Day men. Palle Lykke was their best ever, with 21 wins, then Gert Frank – who I remember well – on 20 wins. Of the current crop, Alex and Michael are top ten, with five wins – maybe soon to be six? 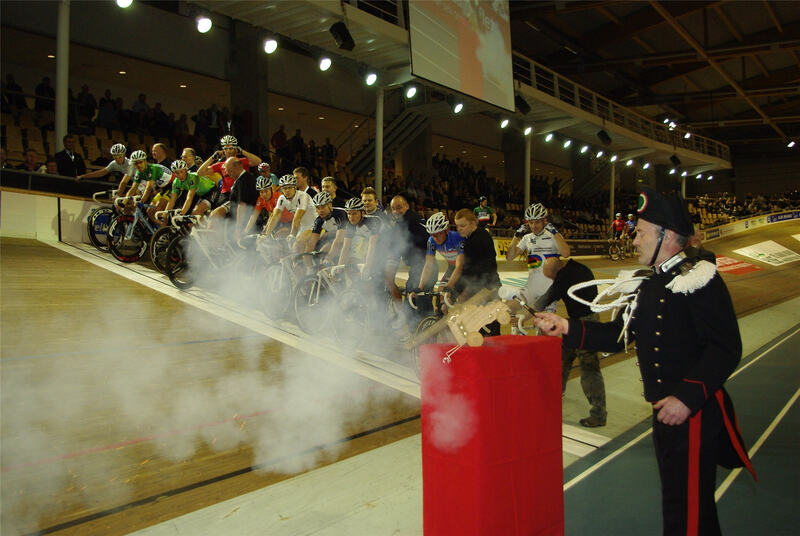 At Copenhagen there’s no ‘rolling’ presentation, a method of introducing the riders to the crowd which has been adopted by most of the Sixes, where the teams line up in a string, pedalling side by side, in numerical or status order (best last) and roll round the top of the banking. The speaker does his thing on their palmarès, they get their applause, swing off, tack on the end of the string and then it’s the next team’s turn. It’s a good way to do it; not least because it gives the riders a nice warm up. Generally Sixes will start with a points race or sprint series, to get the legs loosened off; at Copenhagen it was straight into a one hour chase. And nobody, but nobody, looked sharp – our young guys, in the orange #3 jerseys, Michael Smith Larsen and Michael Berling took a pasting; MSL was hanging on from the start – but so were a lot of others. Incidentally, Michael Berling took second in the Rutland Classic last year, behind Andy Wilkinson – so he’s a good rider. The organiser of the event, Henrik Elmgreen, loves the Sixes but the thinks that you need long chases. There are 70 minute chases and a 75 kilometre handicap chase – the problem is that the riders aren’t used to these distances any more and it makes for cagey racing – guys are frightened that they are going to crack. However, you have to admire the fact that Henrik has a lot of races on the programme for youngsters and always supports the young Danish riders. Viktor and I always used to think that Jaan Kirsipuu would be the man to have at your side if things went wrong in a Ballingry pub. I’ve been forced to revise this; Alexei Shmidt of team #1, ‘Rusland’ is without doubt one of the ‘hardiest bairns‘ I’ve seen in my life; he looks like a cage fighter who keeps fit between fights by laying concrete blocks on a site in Siberia. Faerk, Kreutzfedt ans Smith Larsen warm up. We have a wheen of riders – as well as the two Michaels, I mentioned earlier and our World Champions, Alex and Michael; we have Franco Marvulli, plus Danish World Team Pursuit Champions, Jens-Erik Madsen and Michael Faerk; then there’s ‘Mini Mørkøv‘ – Michael’s wee brother, Jesper; Danish Worlds track medallist Daniel Kreutzfeldt and German Christian Grasmann. Franco shows us the guns. That’s 09:40, best get down for breakfast – then there’s a cabin which looks like a plane crash to be sorted out. Let’s hope for better legs for us all, today. Talk to you tomorrow, ciao, ciao.